Halloween attractions vary just like theatre productions vary. Some like Spooky World are marketed well but don’t have an artistic vision. This year, Barrett’s Haunted Mansion was the most theatrical and well-done haunted house I’ve ever seen. You’ll find five attractions on site. First, next door is the Abington Ale House, where you can come beforehand for dinner or visit afterwards for drinks, which is owned by the same family and is next door. Reservations are recommended. Second, tickets are sold from a small cabin which itself has a spooky walkway with actors to scare you! What a treat. Third, while you’re waiting in line to go in, actors walk up and down the lines spooking people and it’s great fun to watch them sneak up on others. It’s very scary to simply be standing there in line and then, it’s right behind you! So you’re already having a great time, and you haven’t even been to the main two attractions! The Compound is an astonishing upgrade to what was previously The Cell that was a bit ordinary. In the Compound, you’ll find a laser and fog room unlike anything I have seen before, like a green lake of light. There’s a spooky classroom, and a quicksand area. It’s short but mind-blowing. Then in the Haunted Mansion itself, you’ll find a haunted hotel, a spooky elevator that rocks, a hunting cabin, a haunted ship that rocks, a spooky winter wonderland, a blackout passage, a bakery where they’re cooking kids in a pot, a haunted corn field (indoors), scary clowns, and spider nest with video effects in the walls, an infinity mirror, and more. It’s scary on two levels, both startling you and catching you by surprise, but also a more Edgar Allan Poe like creepy intellectual scare that is harder to achieve. Really, I’ve never seen anything like it, and I’ve reviewed 44 haunted attractions in New England, more than anyone else, and some of them several times. First, each room in the attractions was unique and original. I’ve just never seen before a haunted ship or a haunted hotel as part of a Halloween attraction, and many of the others. The actor’s costuming and makeup were top-tier, way out of the ordinary, and the actors had lines to say, not just shouting at you. While attractions like Haunted Acres are great but essentially static year to year, at Barrett’s every year they change the theme. My previous favorite was their Alice in Wonderland year, but now my favorite year at Barrett’s is this year, 2017. The only reason I don’t call it the best Halloween attraction in New England is that other attractions have larger, outdoor spaces that can really keep you for an entire evening. Elsewhere you’ll find a woods walk (Haunted Overload), carnival grounds (Witch’s Woods), theme park (Haunted Graveyard), corn field (Hysteria at Connors Farm), for example. 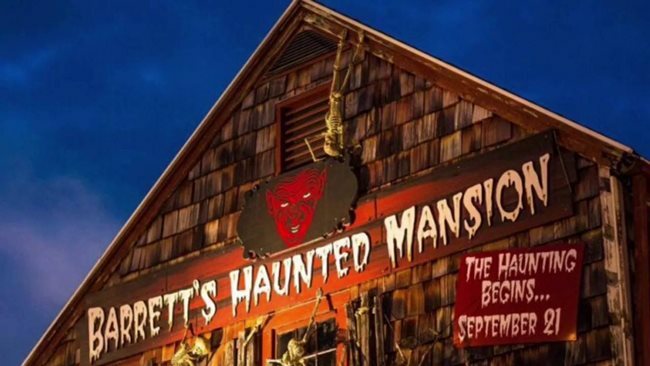 Barrett’s Haunted Mansion has a small store for t-shirts and they sell fried dough, but you wouldn’t spend an entire evening there if you got the VIP tickets. 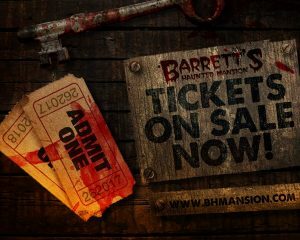 But Barrett’s Haunted Mansion earns a 5+ stars this year for a truly off-the-charts performance of unseen theatrical creativity. It’s wonderfully scary and you’ll scream and then laugh. If you love Halloween, it’s an absolute must see. Check out their Darkness Unleashed nights, October 17 and 24 this year, in total darkness where the actors are allowed to touch you. And they have not-so-scary tours for little kids, where the lights are turned on, Saturdays 2-4pm. Their last date is actually after Halloween, on November 4, so you have no excuse not to go. It’s astounding. I’m speechless. Do not, I repeat, do NOT miss Barrett’s this year. How are they going to top this next year?